Will my DDVF DVD disc work on my player? Your DDVF DVD will play in over 99% of the DVD players on the market today. These players are generally produced by the major manufacturers and are 100% DVD compliant. There are a small percentage of DVD players (around 1%) that do not comply fully with the international DVD specifications. 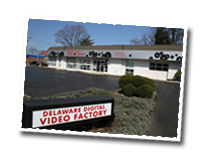 Many of these machines are older or very inexpensive brands and have problems playing certain mass produced DVDs as well as short-run DVD-R discs. I have a “first generation” player. Will my disc work? First generation DVD players are defined as those introduced in 1997, the year DVD was introduced to the world. Many of the players that first hit the streets are not 100% compliant with the entire DVD specification. The number of these players that are incompatible is substantially higher than 1%. What if my disc won’t work in my player? Return your player: If you bought the player recently, you may be able to return it for a new, compliant player. Look for a major brand (such as Sony, Panasonic, Philips, or Toshiba) and avoid no-name, “cheap” players. Most manufacturers are now promoting that their players support DVD-R and DVD+R discs. This is what you want to look for. Buy a new player: Although this seems like a bit of a drastic solution, many major brand DVD players are now under $40. You can keep the older player for another room in the house or give it to a family member as a gift. Here is a list of players that have been identified as possibly incompatible with DDVF DVD discs. Your DVD may not play correctly in these machines.